To promote watershed education in our region, we are taking students out of the classroom and into their drinking watershed! 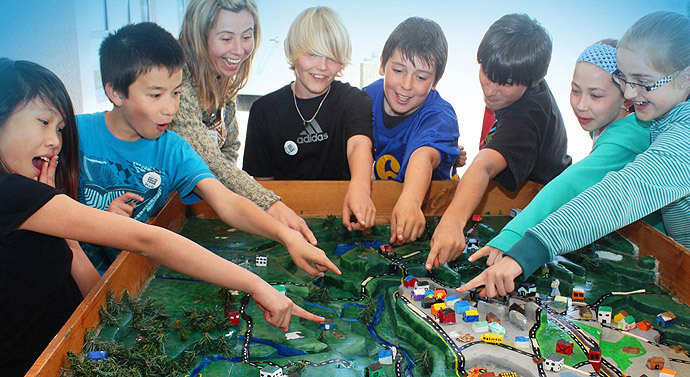 Students will participate in various fun activities that focus on a sensory experience of the river, the forest, the reservoir, the watershed ecosystems and make important connections to their everyday life. Hop on our bus to discover the landscape that water travels through before it comes out of the tap! This full-day trip is currently available to grade 4 & 5 classes in School Districts 68 and 69, as it is designed to be strongly connected to Life & Earth Science PLOs. It includes a pre-trip and post-trip curriculum connected activity guide for teachers to extend the learning experience. Bus transportation will be provided to and from your school. If you are interested in booking a trip call 250 390 6560 or email watersmart@rdn.bc.ca to get your class on the list. Trips run to the Englishman River (SD69) or the Nanaimo River (SD68) in May, June, September & October. For the past couple years, the DWWP program has been bringing the Project WET Curriculum guide to local teachers via an interactive workshop on Pro-D days delivered by WildBC. Educators receive the well-renowned Project WET activity and curriculum guide and learn how to implement some of the various activities in their classroom. This year on Feb 23rd, Project WET was offered at the NDTA Pro D Day at Dover Bay. In addition, Get Outdoors!, a program to encourage teachers to use the outdoors as a classroom, was delivered during the second half of the Pro-D workshop, as a complement to Project WET. For more info, see WildBC's website, Project WET's portal or contact waterprotection@rdn.bc.ca.